One piece of Singapore news that broke towards the end of my US sojourn was that the Urban Redevelopment Authority had announced a concept plan to refurbish the Rail Corridor, the 24-km former Keretapi Tanah Melayu (KTM) railway line that runs from Tanjong Pagar in the south, whips west towards Alexandra and Holland, and finally zips up north to Woodlands. My immediate reaction to the news was: Damn! I better go walk the line before all the "improvements" ruin it. After making plans with a friend, I dug up my copy of the Nature Society and Singapore Heritage Society's Green Rail Corridor guide map, and tried to pull together some additional online information. Maybe my Google-fu isn't what it used to be, but I couldn't find any webpages that would give me the nuts and bolts of exactly how one could access the former railway line from the southern end (since its former terminus, Tanjong Pagar Railway Station, is closed) or how long walking the whole line would take. So here are my notes from Thursday's walk. You can take me away from travel writing, but you can't take the travel writer impulse out of me. Although the abovementioned Green Rail Corridor guide map was printed only last year and is an excellent resource, the rapidity with which things change in Singapore means that it's already out of date in at least one respect: the southern access point to the former railway line. The map states that there is an entry point "behind block 30" at Silat Walk. Alas, block 30 has been demolished. Look for block 23 instead and follow the slope down to the Rail Corridor (pictured above, looking north). If you really want to be pedantic about it and walk the full distance of the former railway line, then this is where you go left (south) towards a hut and the Tanjong Pagar Railway Station in the distance, and start your walk there. I didn't bother. This stretch takes about 45 minutes. 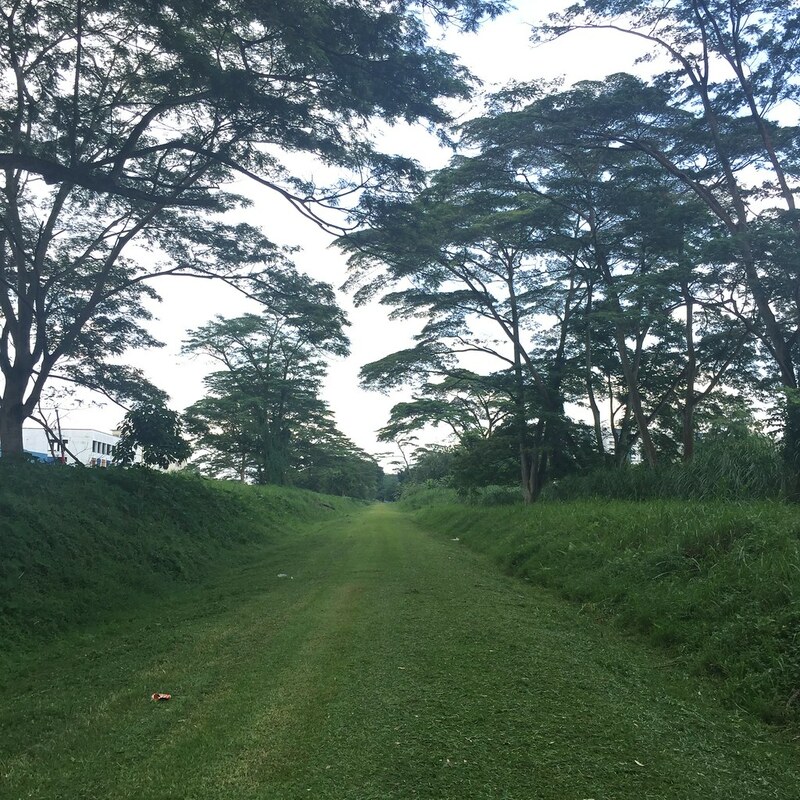 It can be frightfully noisy because you're walking right beside the Ayer Rajah Expressway, but generally it's quite green and not very muddy, and if you listen carefully, you'll still hear birdsong and insect chorus. 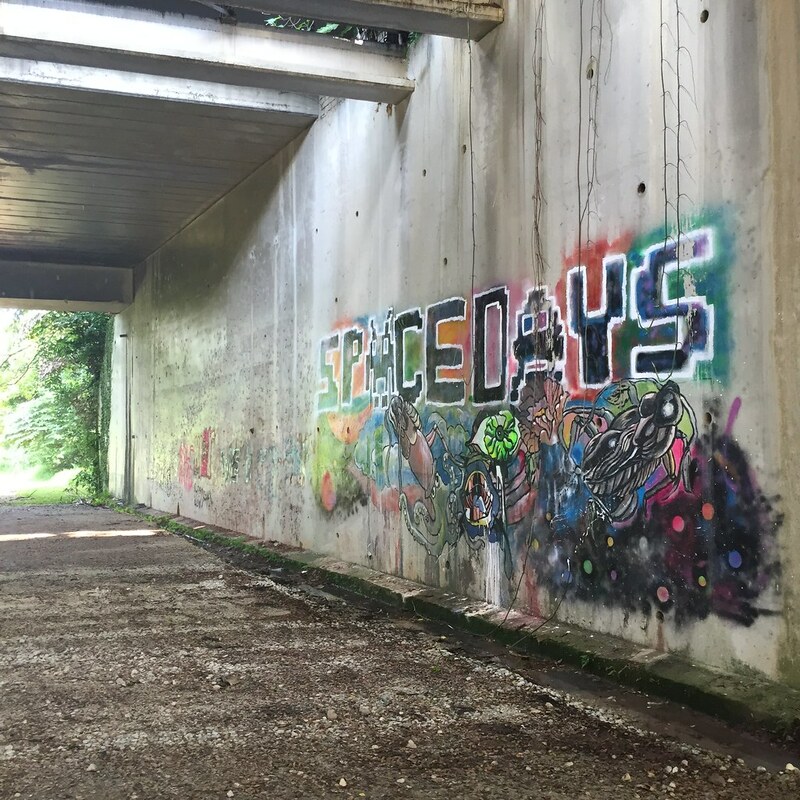 You have to go under several flyovers, some with graffiti (Singapore has such adorable graffiti), and you can wave at the vehicles speeding by and console yourself that at least you're not stuck having to go to the CBD. On your right will be the light industrial buildings of Bukit Merah and Alexandra. Much nicer to look at the trees. At Masjid Hang Jebat, there are vending machines where you can get a cold drink. This stretch takes about 1 hour 15 minutes. The railway line runs beside the old HDB housing estate at Commonwealth Drive and Tanglin Halt. Tanglin Halt Market in block 48A is a good place to stop for a bite without having to venture too far off. Alternatively, you can pop out a bit farther along at Ghim Moh. 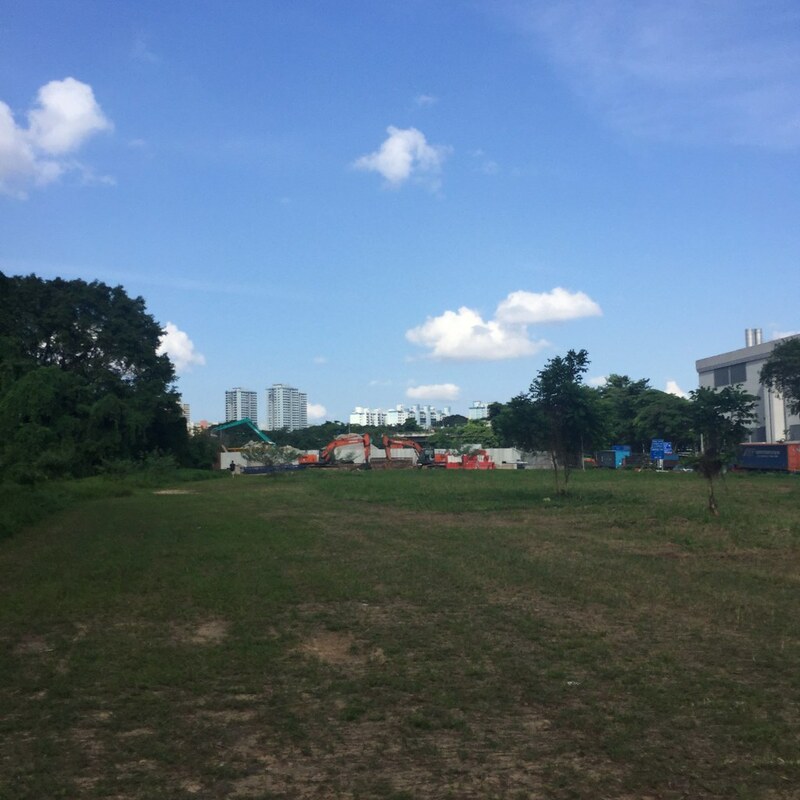 If you're a former Raffles Junior College/Dunman High/Henry Park/Eunoia Junior College student ("Eunoia" – heh heh), you might get a kick out of seeing your former Mt Sinai school campus from this side of the tracks. I was both a student and a teacher at that campus, and the big shock to me on Thursday was that a number of the HDB flats west of Ghim Moh Road have been demolished, and some bulldozers were working on the former container blocks of the Mt Sinai campus (near what used to be the back gate to Ghim Moh). About an hour from Masjid Hang Jebat, in the vicinity of Old Holland Road, you'll run into a construction site. Not kidding. You can keep going straight, more or less, and the route will skirt what looks like a giant drainage project that involves gouging a large section out of the ground. Then you pick up the old railway line again. The Old Holland Road bit is really lush and beautiful; the construction, not so much. This entire stretch (from Portsdown onwards) also has some muddy sections because it's one of the better tree-shaded sections. I wouldn't want to be slip-sliding around here after a downpour, unless I was wearing Phua Chu Kang-style big yellow construction work boots. 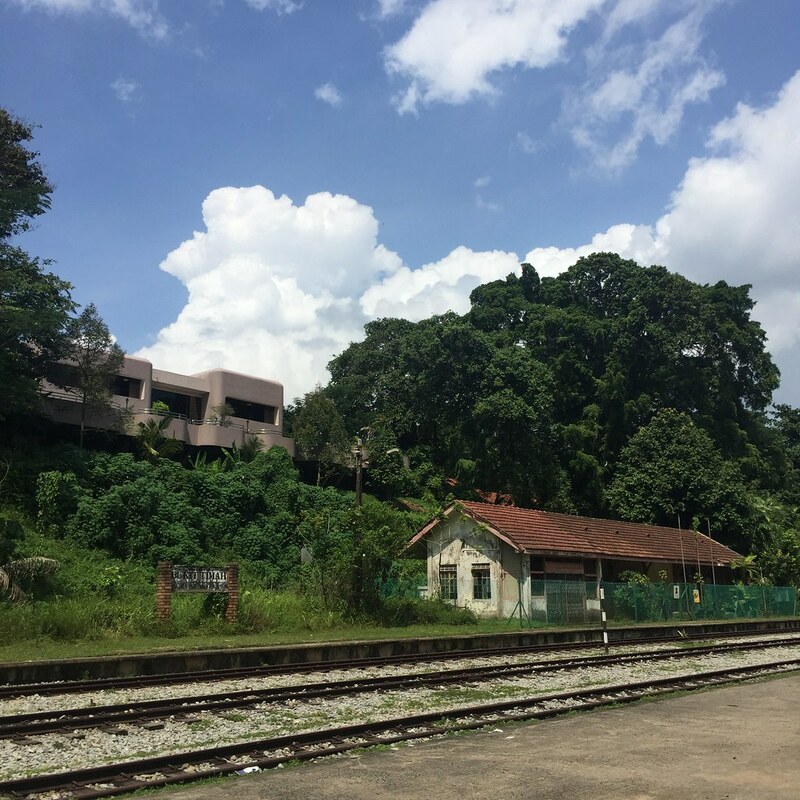 Another 20 minutes from the Old Holland Road area construction area will bring you to the conserved Bukit Timah Railway Station. This section takes about 45 minutes, assuming you don't dilly-dally at the over-photographed Bukit Timah Railway Station (above) and Bukit Timah Railway Bridge. It's a pretty hot stretch. There's a lot of concrete in the railway station area, and then of course the railway bridge is made out of black metal. There are a few more bridges farther up, over Hindhede Road and beyond as the line edges around Bukit Timah Nature Reserve. Some are a little dilapidated and rusty, and more charming, in my opinion. We saw signs of NEA work going on here, like workmen on bicycles and a blue tent planted in the middle of the Rail Corridor (understandably, as shade for the workers, but it did look very odd). If, like us, you're heading north along the Rail Corridor, the Rail Mall at the end of this stretch is a great place to stop for a break because you can console yourself that you've completed more than half the distance (woo!) and also stock up on water or other supplies at Cold Storage. Very Singaporean, I know, to use the names of shopping malls to demarcate this section, and this bit takes only about half an hour to walk. But the reason I'm hiving it off as a discrete section is that it's the part that's extremely exposed (no shade!) and runs parallel to Upper Bukit Timah Road, and as you're walking along on a hot day, you feel like you must be the only crazy people to do so because anyone else would take the bus up the road or at least stick to the shop-houses to get some shade. The shop-houses, viewed at a distance to the right, are charming. It's old Singapore, a little bit of which was described in Kelvin Tong's short film Grandma Positioning System (in the anthology film 7 Letters), and they're still largely functioning as shop-houses with working-class businesses, not hipster coffee joints and atas bicycle shops. One of my friends swears by the food at Karu's Indian Banana Leaf Restaurant at 808 Upper Bukit Timah Road. At Gombak, to the left is the Ministry of Defence and its ziggurat-like concrete structure. I have no idea what that structure is for (ammo dump, my friend guessed) and naturally I can't find a photograph of it online, even though it's pretty damn visible from the road and the Rail Corridor. This takes another half an hour. You have to make a diversion at Junction 10 (at the intersection of Choa Chu Kang and Woodlands Roads) because while the former railway line ploughs straight north, the authorities have removed the bridge that crosses a huge longkang (drain) just north of Choa Chu Kang Road. So your best bet is to walk behind Junction 10, cross the longkang, go past the construction site (sigh) beside the mall, then cut through the car park for heavy vehicles at Senja Way to find your way back to the Rail Corridor. Bright side: once you're back on the corridor, it's pretty lush and green. Down side: about 20 minutes after Junction 10, you'll hit another construction site right beside the Rail Corridor. This is also the stretch that runs parallel to the Pang Sua Park Connector (to your left, across the longkang)(forgive me, I cannot type "Pang Sua" without giggling because of the word "pang", yes, I'm a five-year-old at heart). Some people like to admire the HDB flats to the left; I was too busy trudging on that day. This takes one hour. 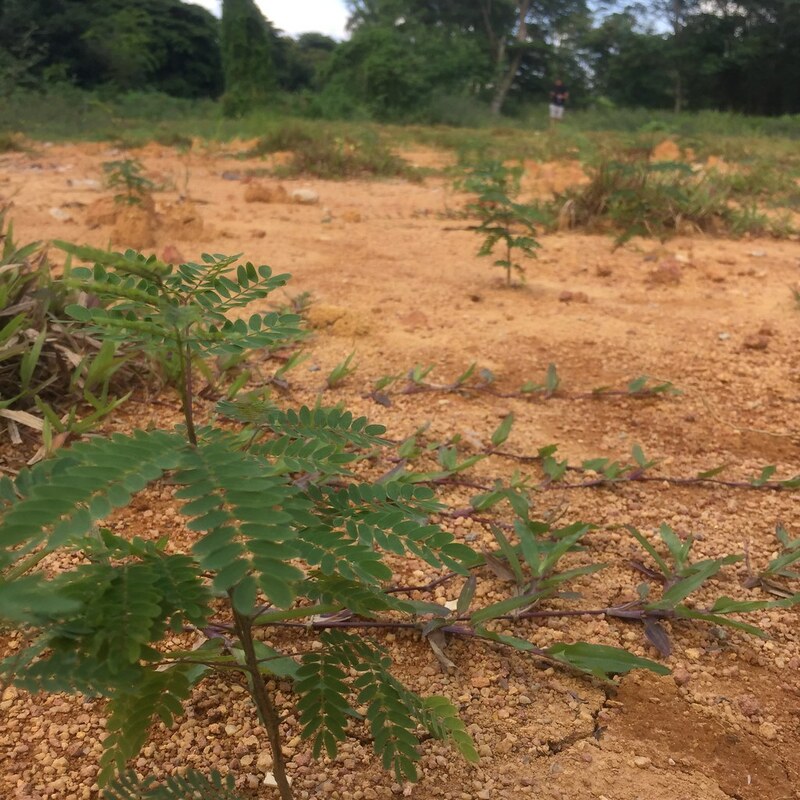 It's very green in parts and potentially quiet (if you ignore the heavy vehicles along Sungei Kadut Avenue, which you have to scamper across, and the traffic noise along Woodlands Road to your right). 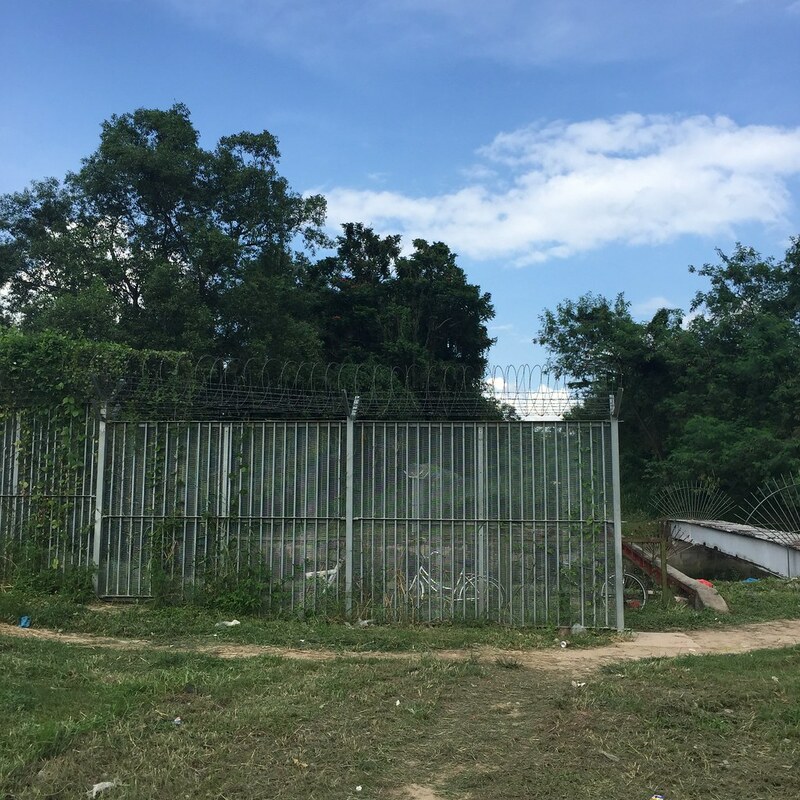 It also has some charming little dilapidated spots, like the former KTM huts (now marked "State property" and "Reserved for future development") and a concrete bridge close to the Kranji Road end that the Rail Corridor runs under. The latter is wonderfully overgrown; I haven't been able to identify it yet. 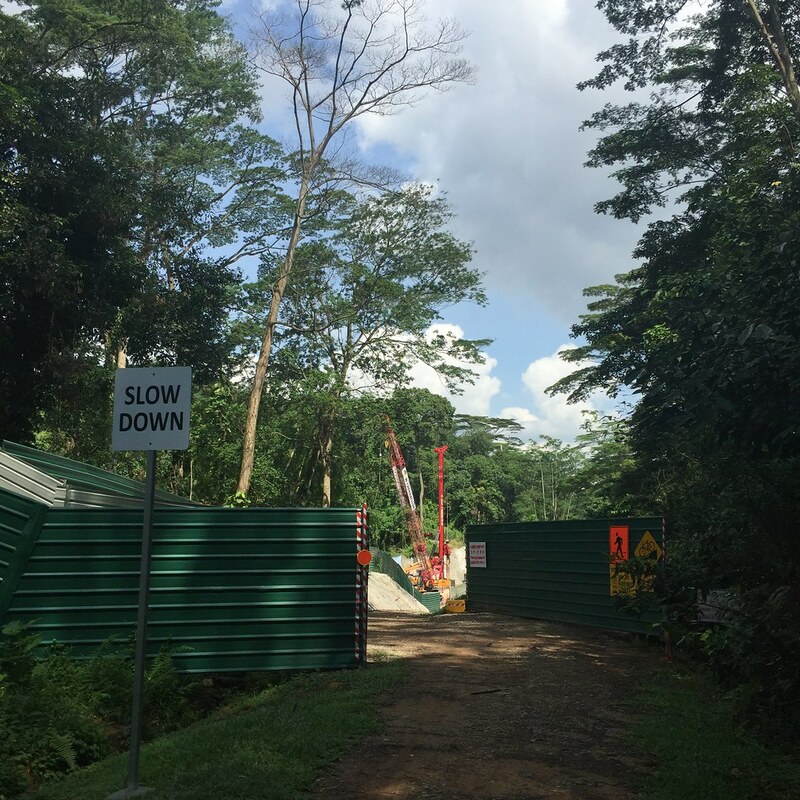 There's another construction site at the junction of Mandai Road and Woodlands Road – it looks like they're doing something that might affect the Sungei Kadut waterway. And finally the green idyll ends where the Rail Corridor spits you out at Kranji Road: there's a heritage marker and, surprise, surprise, a massive construction site. You have to skirt the construction area, pray for a break in the traffic so that you can cross Kranji Road, and pick up the Rail Corridor behind Kranji Water Reclamation Plant and Kranji Lodge (a dormitory for migrant workers). This short stretch is pretty uninteresting. 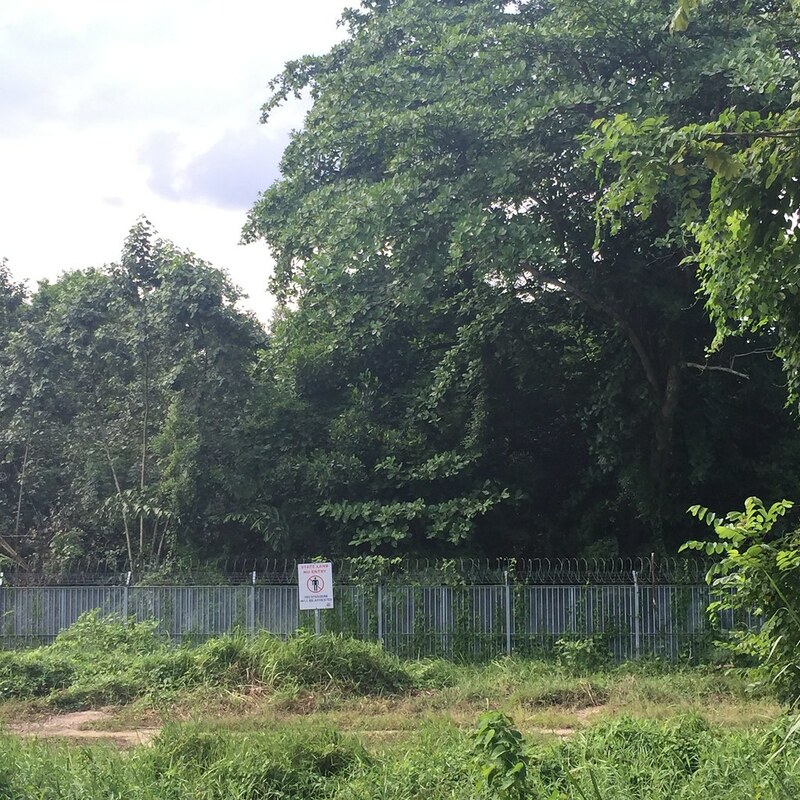 Behind Kranji Lodge, the Rail Corridor ends at Mandai River. If you go to the right of the fence (pictured above), you'll come to a brightly painted bridge that crosses the small river. After the bridge, if you want to leave, go right and follow Woodlands Road towards Woodlands Avenue 3, where Kranji MRT station is. Or if like us, you want to find your way back to the former railway line, you follow the footpath to the left, which brings you to a car park beside Woodlands Road. Just up the road on your left is an Esso petrol station (handy for for a drink stop). Go behind the petrol station. Here it's no longer the the Rail Corridor, since the government doesn't really want you mucking along this stretch so close to the actual Woodlands Railway Station and the Causeway. But you can still follow the former railway line by wandering northeast over weed-covered empty land parallel to the stern metal fences and regularly-planted "State land" signs that warn against trespassing. Unlike the Rail Corridor, where the grass is obviously cut on a regular basis, here there are weeds of different heights and sprawl all over the place. Push on, push on northeast, keeping the fence to your left, and eventually you reach the real end where, once more, true to the spirit of post-independent PAP Singapore, a construction site bars your way. At this point, on your right, you have a great view of heavy vehicles lining up along Woodlands Road to cross the Causeway to Malaysia. Follow Woodlands Road for another ten minutes and you'll be at Woodlands Centre. From there it's about a 15- to 20-minute walk to Marsiling MRT station, depending on how tired you are by now. Average walking speed: 5 km/h and we didn't take any extended breaks except for lunch (I'm moderately fit; my friend has longer legs, is much fitter and recently did a multi-day desert trek in the Middle East). Good guide maps: The abovementioned Nature Society and Singapore Heritage Society's Green Rail Corridor guide map. Users of Foursquare/Swarm should add this tip-top list of Rail Corridor waypoints, created by one of my friends (this is the sort of thing that Foursquare/Swarm can really be good for, in terms of wayfinding and travel). Don't bother with the outdated Urban Redevelopment Authority's map, unless you're interested only in the Bukit Timah Railway Station to Rail Mall section of the corridor. I have a few more pictures and some commentary in my Flickr album. If you like walking in a (fairly) straight line and and on (fairly) level ground, and don't mind doing it in tropical heat, this is for you. Be prepared to sweat like crazy, bring a hat/umbrella and sunblock, and lots of water. I can't speak to the flora and fauna, because I'm crap at recognising anything, but there seems to be healthy insect and bird chatter most of the way, as well as the odd rustle in the undergrowth. Reptile-wise, we saw only one monitor lizard. It was certainly nice to see some of Singapore from "this" side of the railway tracks, and I'm glad I walked it before the government gives it the inevitable makeover. I totally understand why they're park-ifying it: it's not going to become a super-popular "destination" with muddy tracks, unmarked access points and no street lights. I wouldn't walk there at night, and by day, I'm not sure that I would do it alone (except for the well-trafficked stretches near HDB estates). On the other hand, the new concept plan calls for 122 access points (that averages out to one every 200 metres! ), with structures added for rock climbing, urban farming, exercise and "community spaces". Instead of letting people explore the place intuitively and discover for themselves what they find interesting about it, the objective of the concept plan (and much of government thinking about urban planning these days, it seems) is about bombarding people with lots of stuff to do and be entertained, so that they'll have a reason to go there even if they're not at all interested in long walks, railway history or overgrown secondary tropical rainforest. In other words, the concept plan caters to the idea of an urban population that needs to be entertained and coddled, rather than the philosophy of providing basic necessities like street lights, regular grass-cutting and perhaps a few paved sections, and signs for the nearest shelter (in the event of emergencies or inclement weather) – and leaving people to find their own fun. Mashable has reported (albeit a tad dramatically) that the government's plans won't result in Singapore's version of the High Line, which is fine, because I think the High Line is a little too chi-chi and spruced-up. But it works well as a pedestrian connector between Gansevoort Street and 34th Street, and it works well in a city where people walk a lot anyway. Ditto the Promenade Plantée in Paris, which I think has found a sweet spot that between the functional (pedestrian flow) and the aesthetic (tasteful landscaping, but not too much). 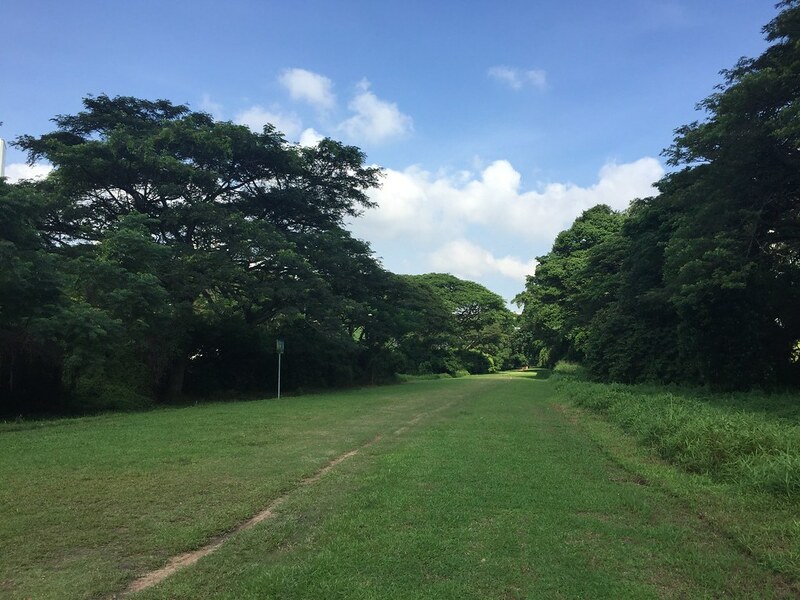 In Singapore, the weather makes it difficult for the Rail Corridor to serve as a pedestrian connector, unless the authorities allow shade-giving trees to grow unfettered around it. But like its foreign precedents, it would be a good alternative to walking along the main road, and it would be a way of seeing beyond roads. The nicest stretches of the Rail Corridor today are, unsurprisingly, the areas where it traverses through neighbourhoods along a route that a car couldn't follow: from Portsdown Road up to Old Holland Road area and then Bukit Timah Railway Station, and later from Sungei Kadut up to Kranji. It's a reminder that there can be meaningful connections between urban spaces other than roads, and yes, it's ironic that it's the remnants of a railway – that fixture of industrial modernity – that remind us of this. I don't think the Urban Redevelopment Authority has announced when they'll be closing parts of the Rail Corridor in order to start the makeover. If you're interested in walking the full stretch, though, I'd say get to it now. Our high-quality experience started out on the pinnacle. Estimator becomes prompt, thorough and correct. owner Fence enterprise was on-website at some stage in the venture, ensuring the great of work and the delight of all the belongings proprietors. Fence company turned into always attentive and eager to thrill. exquisite representatives for the company, we will use Fence corporation again, and we quite suggest them click here for info!